Walking into Marcony, I felt like I was transported to beautiful Capri, Italy. The white walls and blue trim reminded me of the classic white buildings and bright blue ocean that gives Capri its unique island look. Marcony is a small, intimate restaurant that’s owned and operated by Italians who are very friendly and excited when you walk through the door. Typically it can be a big challenge to find many gluten free options when dining at an Italian restaurant but not at Marcony! I requested a trio appetizer and dual entree (not usually offered) this way I can provide a better food review. Below I listed each individual appetizer and entree with its cost to give you an idea of the price range. Octopus like squid can easily be overcooked which is just bad for everyone. However that was definitely not the case here. I really liked the nice crunch grilling the octopus provided on the outside and the tender, chewiness on the inside. The balsamic reduction also brought an added layer of flavor that helped elevate this dish. Oh the mozzarella! It’s so creamy and fresh you would think Marcony made it on-site. Every week Marcony flies in the mozzarella from Italy. This dish is pretty straightforward but I really enjoyed the crushed oregano on-top. This dish was really pretty! The Chef made the artichokes look like opened flowers. I appreciated how this dish was grilled with just EVOO and a very light lemon dressing because it allowed me to taste the earthy flavor of the baby artichokes. The petals also had a slight grilled char yet the heart of the artichoke was still soft which I really enjoyed! Very traditional pasta with tomato basil sauce. The sauce was a vibrant bright red that had a smooth, velvety texture and the right balance of acidity as well as seasoning. The gluten free pasta for both dishes is the same. To date, it’s the best gluten free pasta I have had. It was cooked just right and to me the texture and taste was just like traditional pasta. This sauce was my favorite between the two gluten free pasta dishes. I am normally not a fan of bolognese sauce because of how filling it can be but this was anything but. 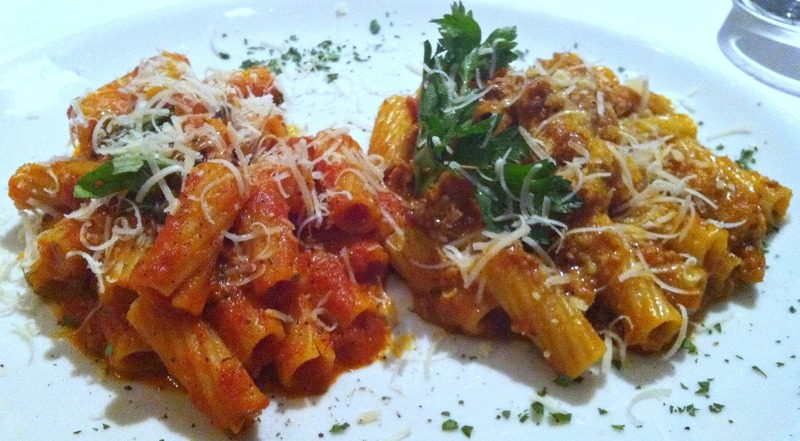 The veal meat sauce was creamy but very light and flavorful. The foundation for this sauce is the tomato basil sauce used in the dish above. Fun Fact: A relative of the owner has Celiac Disease which has been the catalyst for providing many gluten free options. Marcony takes being gluten free seriously and prides itself on creating unique specials everyday that are based on traditional cuisine from their beloved Capri, Italy. I really enjoyed my dining experience at Marcony Ristorante. For me the atmosphere and friendly staff is equally as important as the food and all three were great. Offering so many gluten free options that look and taste great plus being so accommodating makes me a big fan of Marcony and I will definitely go back!